Get This Brand New BMW for 20% Off! In the market for a new car? I’ve got a deal for you. How about a 2017 BMW sedan for 20% less than it cost last year? Some people in Britain are waking up to just such a deal, in the wake of the collapse of the British Pound following the summer’s “Brexit” vote. But wait… hasn’t the British Pound cratered and actually made things more expensive? Yes—if your savings were entirely in pounds. Those Britons who took smart steps to preserve their purchasing power, however, haven’t suffered. In fact, many of them are finding some sweet deals. It’s a lesson that will sooner or later apply to all of us: when a government (or a referendum, in this case) makes a bad move, the value of the currency in your bank account can fall fast. We’ve seen this a hundred times the world over; eventually it’s caught up to every country and every currency. Time again, gold and silver owners, however, have seen their standard of living not just preserved but actually grow. Indeed, the pound in international markets has fallen through the floor, particularly after Brexit passed. It thus takes more currency to buy the same products and services. But not if you’re using gold. 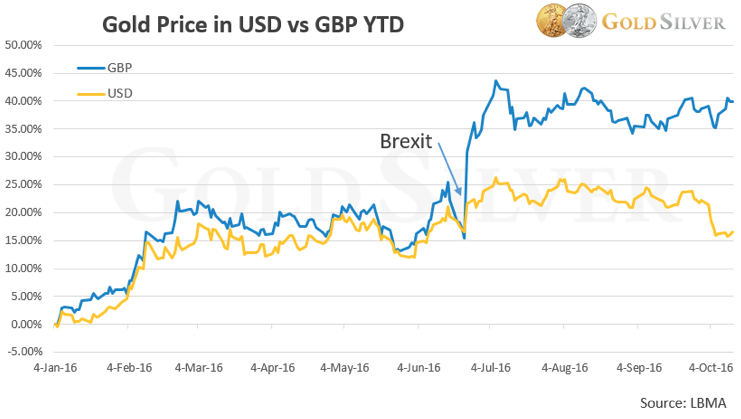 We all know gold has had a good year, but look how it’s performed when priced in British pounds versus in US dollars. Gold priced in pounds is up a whopping 40% year-to-date. That means their gold proceeds go a lot further than they did when the year started. Their purchasing power has increased—while that of their fellow citizens has fallen hard. Due to the fall in the British currency, the cost of the BMW has gone from £26,700 to over £32,500. 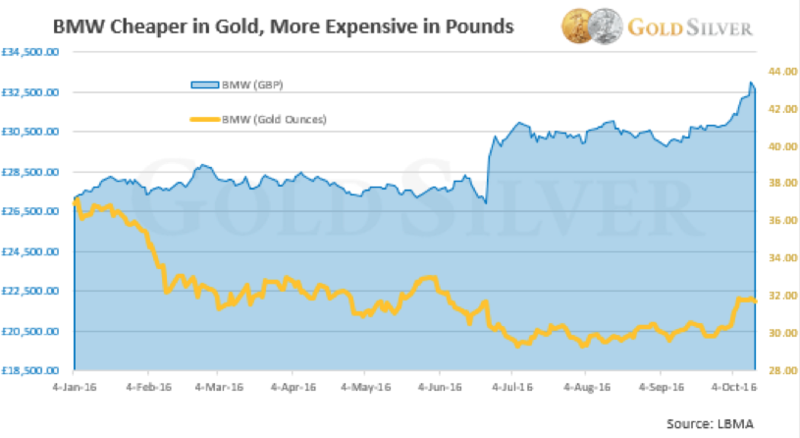 But if you used gold proceeds for the purchase, the price fell from about 37 ounces to 32. The purchasing power of gold owners wasn’t just preserved; it grew! This is by no means an isolated example. The same thing happened two years ago to the Canadian dollar. Over an 18-month period in 2014 and the first half of 2015, the “loonie” fell a whopping 25%! This also involved no crisis—it was just over a scare of slower growth. When the US dollar goes, every standard of living around the globe will be impacted. Mike and I are convinced that physical gold and silver owners will see their lifestyles advance in the next wealth transfer. But in a crisis there will be a lot more pressing needs that deserve our attention. And gold and silver can help you deal with them, regardless of which country you live in or what currency you use. And what about the needs of people or organizations you care about? You undoubtedly can think of more things in your life that you might need to be financially prepared for. Consider how gold and silver could help you cope with each of these areas of your life. Indeed, precious metals can serve a very useful, perhaps lifesaving purpose. I suggest we all continue to accumulate a meaningful amount of gold and silver bullion and be prepared for whatever comes our way. BMW or not.